2000 Souls Come to Jesus in Orlando and Philadelphia! | Lift Jesus' Cross! ← Let’s Agree Together in Faith for our Nation . . .
2000 Souls Come to Jesus in Orlando and Philadelphia! Posted on October 4, 2013	by Lift the Cross of Jesus! Greg Laurie’s evangelistic crusade in Philly had about 20,000 in attendance, and about 2,000 born again! 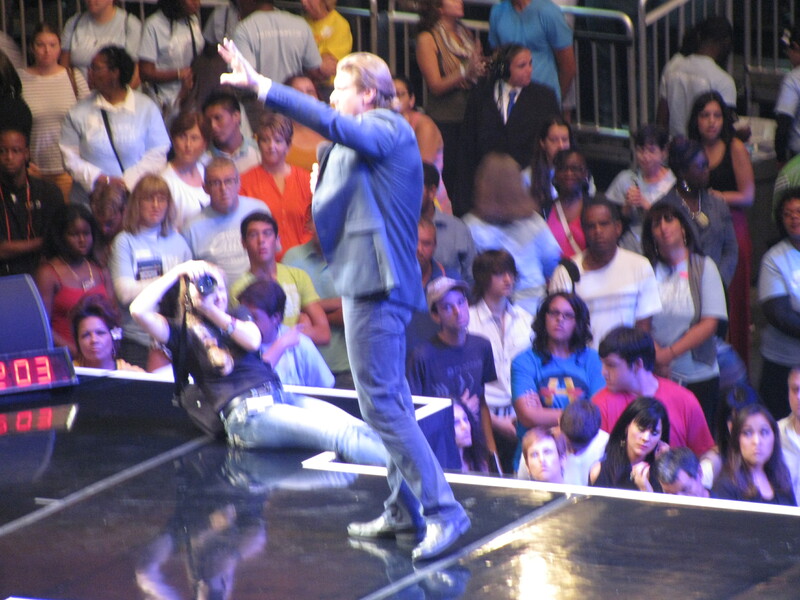 Reinhard Bonnke’s evangelistic crusade in Orlando had about 20,000 in attendance and about 2,000 born again! That’s 4,000 new believers and the angels in heaven are rejoicing! 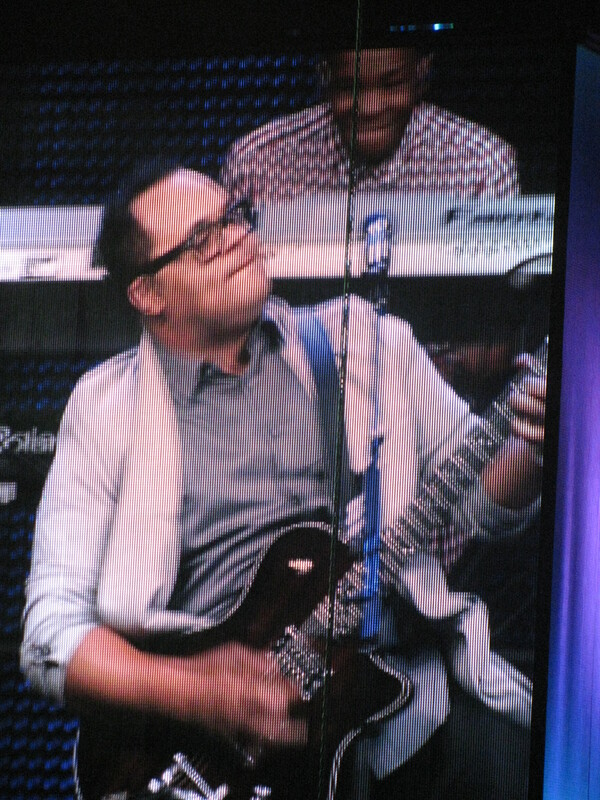 (German Evangelist Reinhard Bonnke preaches at Amway Stadium in Orlando Floriday, right). Rather than talk a lot, I want to share photos with you. I couldn’t be in two places at once, or I’d love to have covered the Laurie crusade. I was in the press box at the Orlando crusade and I had the “eagle’s nest” view. Just let me say that I wept as I saw people coming down from the top tiers of the Amway Stadium in Orlando to receive Christ. The scene reminded me of Billy Graham crusades that I saw in my youth. To actually see this with my own eyes and bring this story to you and to others blessed me immensely. Nothing thrills me more than seeing a new child birthed into the kingdom of heaven. Praise GOD!! Reinhard Bonnke preached the gospel, and hundreds came forward for salvation and were met by trained counselors who prayed with them and helped them to fill out decision cards. Each person that is born again is invited to a local church. 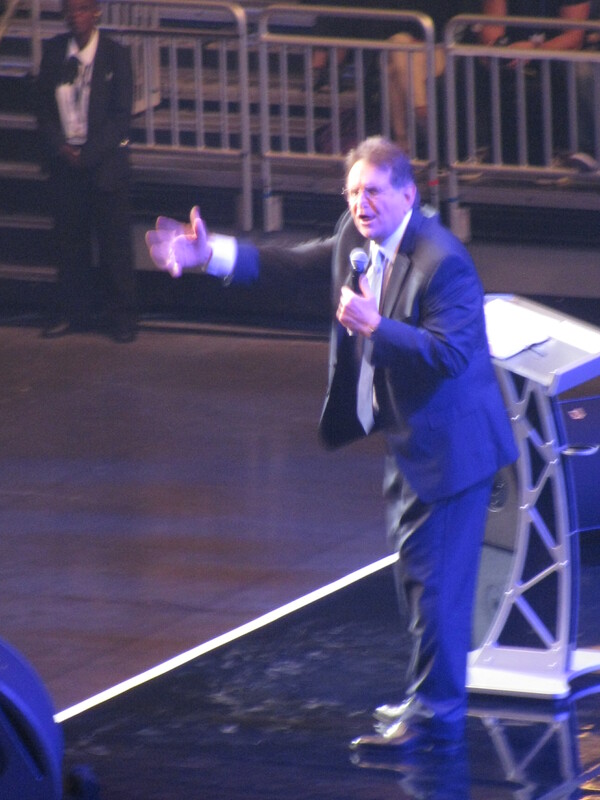 After Evangelist Bonnke preaches, his successor, Evangelist Daniel Kolenda, comes to the podium to pray for the sick. Man with knee injury was healed. Woman with high blood pressure healed, and her blood pressure completely normal the next day. Woman blinded in right eye, healed. Woman with debilitating asthma healed and could breathe normally again. There were more, but I cannot remember or document them all. Both evangelists stressed that the most outstanding miracles both evenings were the people who were born again. The preaching was outstanding and the gospel never made more clear. Hallelujah! The article I wrote for Christianity Today is actually a contributing report and I will notify you when it is released. THANK YOU for praying! We endured an 18 hour drive to get there and will endure another 18 hour drive to get home (beginning tomorrow), but it was WORTH IT! Praise God! 5 Responses to 2000 Souls Come to Jesus in Orlando and Philadelphia! Thank You, Father! Grant traveling mercies for Hope’s return home. Back in the ’80s Billy Graham was in Denver for a week. I was in the box seats overlooking everything because we were there praying for people to be saved. That series he did there had twice the number saved than in previous crusades. Marlene, thank you for praying. We’re all home safely. I am eager to follow up this report with CROSSES we saw on the way home. More on that later. Mark, it is so cool to see people come to Jesus. I was honored to witness that first net cast into American waters. David, you were blessed to be able to participate in intercession for the Billy Graham Denver crusades in the 1980’s. I found out that the Orlando crusades were preceded by prayer and canvassing the entire Orlando area. 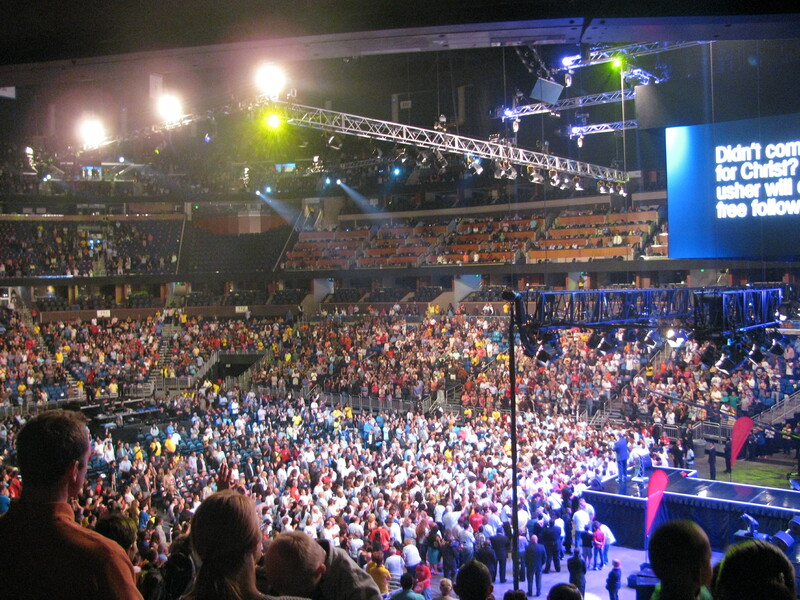 People were invited to the Amway Center for the crusade. A number of people were born again as the churches and volunteers teamed up with some of the CfaN staff to tell people in the area about the upcoming crusades. Reinhard Bonnke’s staff did a great job announcing the upcoming meetings. I saw his photo and meeting announcement on the side of a bus and on billboards. They did a great job. It takes a lot of work and prayer and volunteers to make this sort of thing happen. One thing is disturbing to me, that we should need to be evangelized by someone from another country. We’re a missionary sending nation and we’ve become a missionary receiving nation. We’ve descended into places far from our Savior. We’ve failed to keep up our own responsibilities and today’s ethics are far from what we once stood for. The way we’re headed terrifies me far more than jihadists.